Isn’t it annoying when you want to connect to your home network while out and about but don’t know what your IP is? Sick of dynamic DNS sites with arbitrary restrictions on their free tiers? Well look no further! This tutorial demonstrates how to point your home IP to a subdomain of your website using a simple PHP script. That URL grabs the IP hitting it and points your subdomain to the IP. 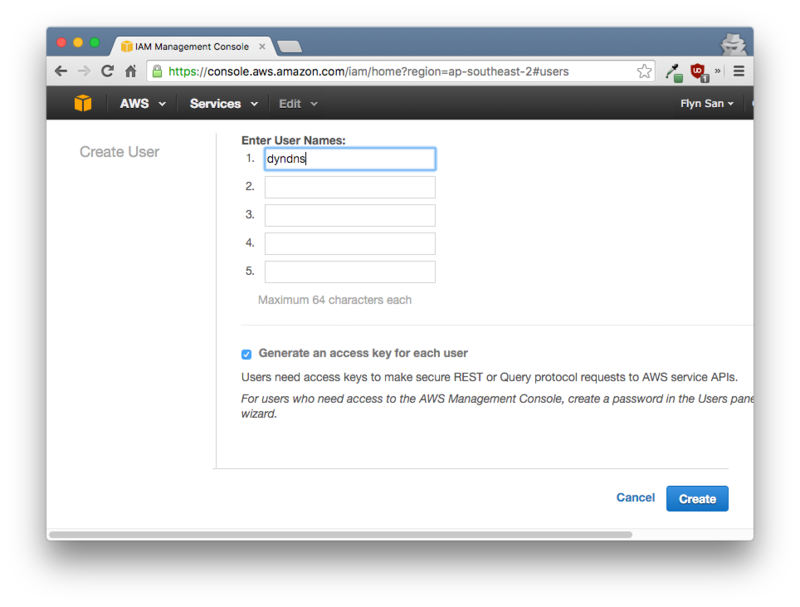 To use the AWS API, we’ll need an IAM user profile with relevant permissions. 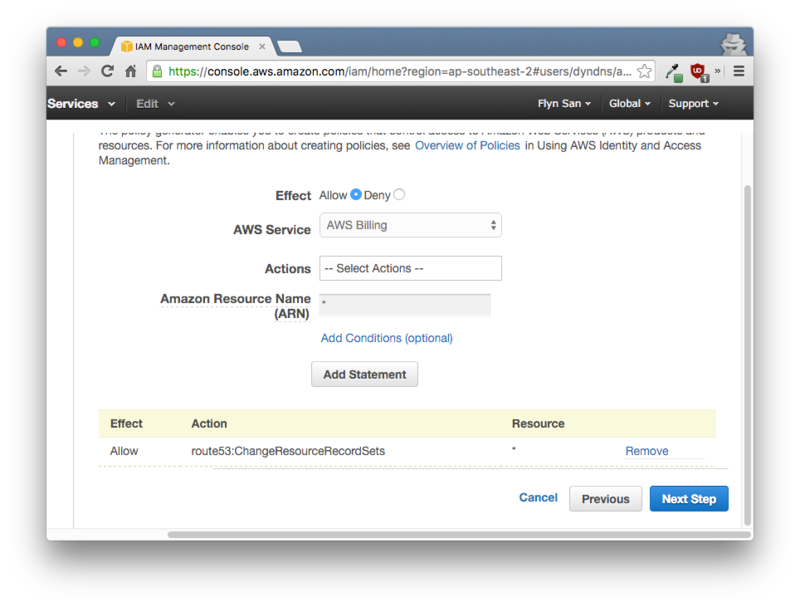 Log in to the AWS management console and go to Services – IAM – Users and click Create New Users. Name the user dyndns and click Create. Click Close twice then click your new dyndns user to open it up. We have your user created but it still doesn’t have permission to modify Route 53 routes. Amazon Route 53 is a highly available and scalable cloud Domain Name System (DNS) web service. We need a subdomain to point towards our home. For this tutorial, I’ll call the subdomain home. 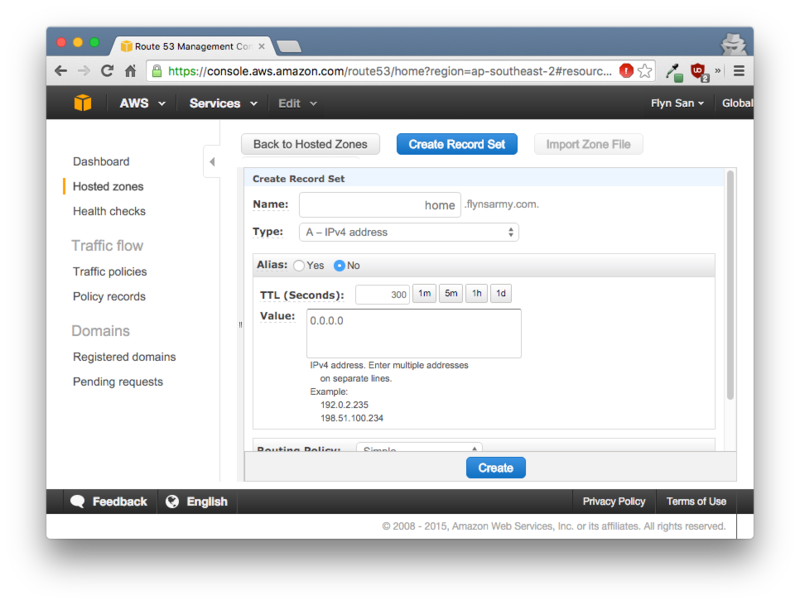 In AWS Management Console go to Services – Route 53 – Hosted Zones – and pick the domain you want to use. Take note of the Hosted Zone ID of this domain – you’ll need that later. Note: Don’t worry that 0.0.0.0 isn’t your correct home IP – this value was used so we can see if the script is working correctly later on. // be able to read the ~/.aws/credentials file created with aws configure. // So specify the file to read manually. // - $recordName - e.g 'home.yourdomain.com.' Include the trailing dot character. // - $ip - Your new IP address. Change 'Type' below to 'AAAA' if using IPv6. At your home you’ll need to set up a scheduled task to hit the new /dyndns URL. This can be done on a PC, a NAS device or even your router if it supports such a thing. A simple hourly curl http://yoursite.com/dyndns command will suffice.